Once in a while someone does something for someone that needs to be documented. This will be a story of life, death, sacrifices and donations; all of which add up to a gift from the heart. Tina Pattison had a son, this son was just as you would think; active, fun loving, and very active in hunting and fishing. If you were to visit the HOAL websitewww.huntofalifetime.org you would see that Matt wasnt only a young man that lived to hunt, he was also a young man that loved to pass the heritage on. Matt was stricken with a terminal illness at the age of 18, something all mother’s and father’s fear the most. Matt had a dream to hunt, and that dream was to hunt a moose. If we all look back we can remember a group that catered to kids who were very ill. This group would grant a wish to these children so that they could realize their dream; this group was called The Make a Wish Foundation. The Make a Wish Foundation is an awesome group and I wouldn’t want to take anything away from what they do, however, another group, one that I do not look on as a good group let the Make a Wish Foundation know that they were against the hunting part of The Make a Wish Foundation and hearing this The Make a Wish Foundation buckled to the pressure that this worthless organization was causing. This group is only mentioned on the HOAL site as an “anti-hunting” group but I bet we all can guess who was behind the pressure that forced the decision of The Make a Wish Foundation. The great news is Matt got his moose, the bad news is that Matt lost his battle to cancer and left a huge hole in his parents heart, a hole that is being filled one hunt at a time through generous donations and time from complete strangers, strangers, who like us, are hunters and fisherman and parents to kids of our own. You can never close that hole in your heart and maybe we are not supposed to, but, there can be a way to make the hole smaller and The Hunt of a Lifetime Organization is doing this for Tina, and Chester along with many other family members who are faced with the cold fact that cancer and other deceases do not discriminate between age, race, or religion. Here in Arizona we have some of the most generous people in the world. This state always fascinates me when it comes to helping others and in the case of the Hunt of a Lifetime it was no different! Not only did we have guides to help these kids we have people who donate money for hotel rooms, companys like Cabelas, Gander Mountain, Mossy Oak and others who donate gear and guns, and anything else that is needed to make this the best experience that it can be for the kids. Huge groups like the NRA and the Safari Club International are there for anything that is needed too. As you can see, there are tons of groups and companies that are at the ready to do the right thing for these people and these kids. Getting back to Arizona, last year I was lucky enough to find out about The Hunt of a Lifetime through a website that I frequent. There was this young lady that was asking for help from any guides in Arizona that could help with a hunt for The Hunt of a Lifetime. This young lady did her part to capture these hunts on videos so that the kids and the parents would have these memories forever on film. The young lady is no other than Stephanie Rainey who is on the Arizona committee. Stephanie has her own business that allows her to video these hunts, and at the same time she fulfills her desire to do something good for someone else. Stephanie isnt alone in her desire to help these families, no, there are many more. The Ambassador to Arizona is a man by the name of Terry Petko. Terry is always working to find guides, sponsorship, and donations in Arizona. I can honestly say that Terry must be doing a great job because there were some very happy hunters last year in Arizona. The first young man that The Hunt of a Lifetime assisted in living his dream here in Arizona was young man who was diagnosed with bone cancer, luckily he has been in remission for a year and he is doing well. The way that this young man received his tag is a story all of itself and I feel it necessary to tell this story. Arizona has had some living legends in the hunting world and last year we lost one of those living legends in a tragic second. Norm Pint has been in Arizona as long as I can remember and I have been here a while. Norm had many interests and one of them was hunting, and teaching hunting to anyone who wanted to learn. It was on one of his beloved hunting trips that Norm lost control of his truck and lost his life. He will be missed by anyone and everyone that knew him. Norm had been putting in for bighorn sheep in Arizona for ever and last year, 2005, was his year to be drawn for that elusive tag. 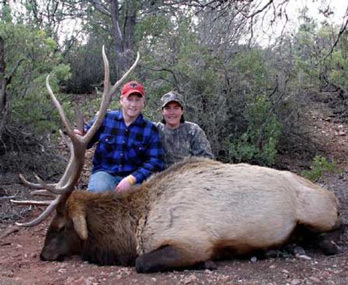 Norm was number one out of two tags that were selected to hunt in a unit near Kingman, Arizona. This tag was donated to the Hunt of a Lifetime by the family of Norm Pint. The Pint family was still heavy into the grieving process when they decided to make this happen for young Christopher Reeves. Christopher is like all 16 year old kids that like to hunt. He is ambitious and excitable and he very much wanted to shoot a nice ram. This trip has many heroes and they all need to be mentioned here but because of space I will write about a few. There is a man named Don Martin who lives in Kingman. Don owns an outfitting company that goes by the name of Arizona Wildlife Outfitters. 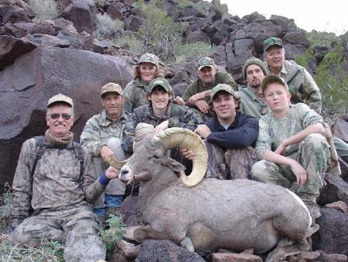 Don has some great guides that work with him and it was one of these guides, Larry Sallee, along with Bill Luffy of the Arizona Bighorn Sheep Society that showed Christopher his seven and half year old ram! As usual the shot was anti climatic in comparison with what was happening all around Christopher, people were literally giddy that he shot the ram and they could not have been more proud to be a part of such a grand event!! Many thanks to Terry Petko, with Hunt of a Lifetime, Pat Feldt, with Arizona Guided Hunts, Arizona Desert Bighorn Sheep Society (Dave Pence, Ignacio Beltran, Bill Luffy, Jim Unmacht, Jimmy Unmacht) and all the others on the team (including AWO guides Larry Sallee, Dan Reed, and Kevin Ridgers) who made this young man’s dream become a reality! As you all can see by the smile on Christophers face, and the rest of the smiles, this stuff is worth every second that we can spend on it. Life is full of bad news but in this case there is nothing but good news to report and write about. Bighorns are what we dream of hunting as hunters but another awesome creature we have here in Arizona is the Wapiti, or, Elk, and for another young man it was what he dreamed of hunting and The Hunt of a Lifetime was right there to make it happen. 17-year-old Karl Hoidal, who was diagnosed with Hodgen’s Lymphoma at the age of 15, was the next lucky young man to be bestowed the honor to hunt with a couple of the best guides we have. This father and son guide team of Randy and Josh Epperson own their own outfitting company called Rimrock Outfitters. The two of them are known for the excellent mountain lion hunts and they are both awesome elk guides as well. I spoke with Josh about this hunt and he said that young Karl was all pumped up to hunt and just wanted to shoot a nice bull elk, and that is exactly what he did. Josh told me that Karl made a perfect 440 yard shot on his bull that was taken just north of Payson. Karl and the Eppersons were being filmed through out the hunt by Stephanie Rainey and now the hunt will be on film for ever. Here is a picture of Karl Hoidal and Stephanie Rainey (note big smiles on both of them!) This is what it is all about! Making these kids happy and creating memories for years to come. In the world of hunting there always seems to be a battle. We battle antis all the time just so we can keep doing what we love to do, we battle our finances to make the next trip, or we battle our boss to let us off so we can go hunting. Doesnt all that seem small after reading about these kids? There is a song that plays on the radio once in a while that says something about “Live like you were dying” you know what, I understand this song and that is why we all have to help these kids realize their dreams. I would encourage all of you readers to visit the Hunt of a Lifetime website and see for yourself the great things that Tina and her husband are doing for these kids. You need to support the stores that help people like this and make sure you drop a line to Tina and tell her how you feel about the group she formed through the power of love. For more information about The Hunt of a Lifetime organization you can go towww.huntofalifetime.org and see for yourself. If you are interested in helping this group you can find links that will help you find the correct way to donate your time, money, or anything else that will assist in the future of this group. If you are a guide here in Arizona and you would like to donate your time and services you should contact Terry Petko (602) 689-9524 or email him. The world of hunting is made up of some of the best people that have ever walked the earth. There are so many people involved with this group that I would have to dedicate several pages to give them accolades. I hope you all take the time and see for yourself what helping The Hunt of a Lifetime can do for some of these kids–you will never, ever regret it. Way to go, with your help.